In recent archaeological thinking, it is widely accepted that objects and artefacts are invested with agency, but this understanding is not commonly extended to landscapes; rather any notion of ‘agency of landscape’ is often regarded as synonymous with environmental determinism. This symposium seeks to redress the balance and investigate how landscape can be invested with agency without being environmentally deterministic. While this one-day symposium is organised in the context of the English Landscapes and Identities (EngLaId) project, which investigates the development of English landscapes from the middle of the Bronze Age, when the first extensive field systems were laid out, to the Domesday period, when the foundations of the modern agricultural landscape were in place, contributions are encouraged from any archaeological, geographical or other relevant disciplinary perspectives. We also welcome contributions that consider different parts of the world and different time periods. Abstracts for 20 min papers and poster presentations are invited that address this tension between cultural choices and the structuring influence of the landscape itself. For more information or to register interest, please contact Dr Laura Morley: laura.morley@arch.ox.ac.uk (Wednesday to Friday). DEADLINE FOR ABSTRACTS: 3 MAY 2013. This entry was posted in Uncategorized on April 22, 2013 by admin. The Faculty of Arts and the Faculty of Philosophy, Theology and Religious Studies at Radboud University Nijmegen jointly welcome abstracts for an international conference on their common research theme ‘Europe and its Worlds‘. At the core of this theme is the question of how Europe has always consisted of different worlds, how it differs from the rest of the world, and how it interacts with other worlds. This conference specifically addresses the many ways in which cultural mobility impacts on European culture, past and present. Scholars of various universities and scholarly backgrounds are invited to submit an abstract for one of the twelve panels listed on the conference site. You are young, interested in questions of urban sustainability and studying or working in a related field? You are interested in getting to know people from the same field in an intellectually challenging atmosphere, surrounded by the beautiful scenery of the Austrian mountain village Alpbach? You dare to step up in front of them and tell them about your own ideas and projects? We invite you to take part in a Science Slam on “Sustainable Cities” at the Built Environment Symposium during this year’s European Forum Alpbach, from 29 to 30 August, 2013! You get the chance to present your ideas on urban sustainability in Alpbach according to the Science Slam rules: You have 8 minutes for the presentation (a max. of 3 power point slides with only visual presentations is allowed, if needed) – be creative and give an interesting, entertaining and still substantial presentation! What counts is not only the topic but also the way you present it. The winner will be identified by the audience and be awarded by the European Forum Alpbach. Invitation to contribute to this themed issue, planned for 2014, of Urban Design and Planning, a journal published by the Institution of Civil Engineers. Urban Design and Planning publishes refereed papers and short articles addressing the design and planning of the built environment, emphasizing the interfaces between urban policy, design, construction and management. Topics covered: social, economic and environmental aspects of topics such as sustainable settlements, community regeneration, urban infrastructure and transport systems. Could urban re-industrialisation be seen as a method of increasing business effectiveness in the context of a politically stimulated ‘green economy’? Could it be seen as a nostalgic mutation of a creative-class concept, focused on 3D printing, ’boutique manufacturing’ and crafts? These two notions place urban re-industrialisation within the context of the current neoliberal economic regime and urban development based on property and land speculation. The key question for this conference is could urban re-industrialisation be imagined as a progressive socio-political and economical project, aiming to create an inclusive and democratic society based on cooperation and symbiosis that goes way beyond the current model of a neoliberal city? Abstracts will be selected for further development as papers to be presented at the conference. Papers shall be 2000 words maximum. Further submission requirements will be distributed to the authors of selected abstracts. Abstracts should arrive no later than Monday 1 April 2013. Please send them in .doc or .pdf format to: krzysztof.nawratek@plymouth.ac.uk Keynote presentations and selected conference papers will be considered for publication following the symposium in an edited volume. 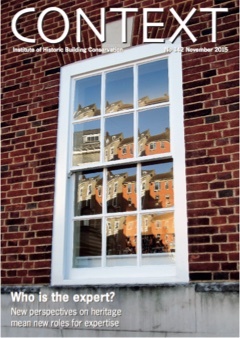 The themes for forthcoming editions of Context, the journal of the Institute of Historic Building Conservation (IHBC) Context, are regularly published on the Context page of the IHBC web site. Themed issues of Context also include more general conservation articles as well as news, book reviews and reports from IHBC’s officers. This entry was posted in IHBC on April 22, 2013 by admin. The Society of Architectural Historians of Great Britain (SAHGB) is pleased to announce that on 3 May 2013, it will run its first ever Graduate Student Forum, a student-led event, hosted by the Bartlett School of Architecture, UCL.